Imperial walkers have landed on the surface of Hoth and advance inexorably towards Echo Base, crushing all that stands before them with a hail of laser fire and waves of Snowtroopers. As the Rebels flee and scatter across the galaxy, you and your fellow heroes join a group of refugees seeking shelter in the Outer Rim. Though you may find temporary safety, the Empire is scouring the galaxy for any sign of Rebel sympathizers, and soon, a desperate plan for survival may lead you to return to the site of the Rebellion’s greatest defeat—the icy planet of Hoth! 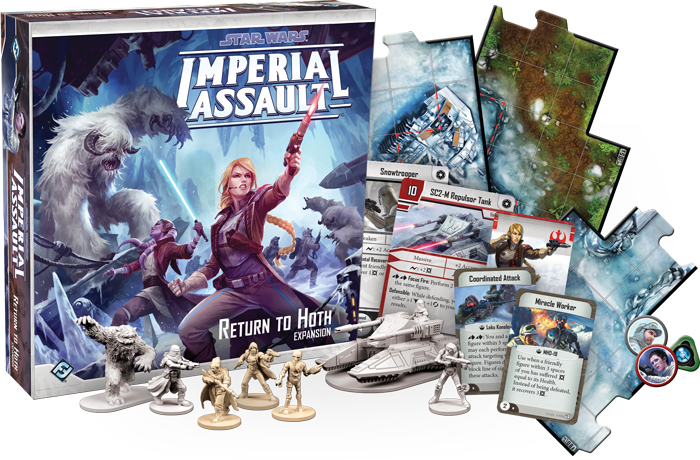 Within this large expansion, you’ll plenty of content to bring your games of Imperial Assault in entirely new directions. For your campaign games, Return to Hoth provides an entirely new, full-length campaign set in the aftermath of the Battle of Hoth. Your skirmishes, meanwhile, can benefit from brand-new multiplayer rules that allow up to four players to battle at once. Whichever game you play, you can take advantage of the sixteen sculpted plastic figures included in Return to Hoth—three Rebel heroes, six Snowtroopers, four HK Assassin Droids, two Wampas, and an SC2-M Repulsor Tank. In addition to Return to Hoth, four new figure packs bring new life to their corresponding characters far beyond simply replacing the token included in Return to Hoth with a sculpted plastic figure. 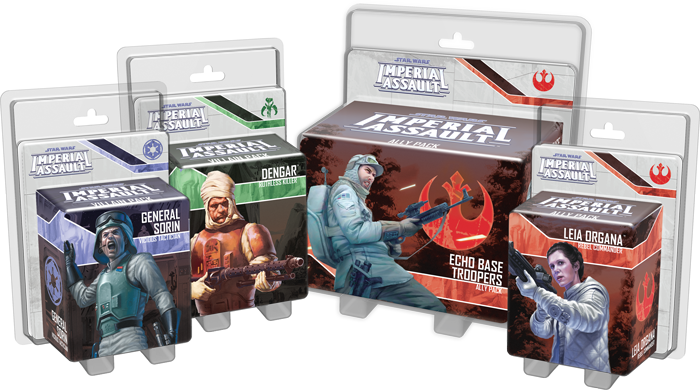 Each figure pack includes new missions for both your campaigns and skirmishes, alongside new Agenda cards, Deployment cards, Mission cards, and Command cards that invite you to brave the cold and expand your strategies in any game of Imperial Assault. 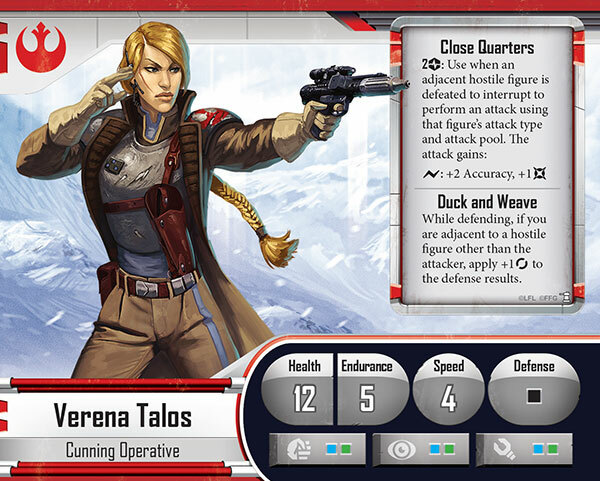 Our first preview of the Return to Hoth expansion focused on the new heroes who join the Rebel Alliance here. MHD-19 is a combat medic droid who’s perfectly equipped for healing his fellow heroes and can even wield a blaster if it’s necessary to defend his patients. If you’re more suited to attacking from afar, you may turn to Loku Kanoloa, a member of the Mon Cala Special Forces and an adept sniper. When you play as Loku Kanoloa, you place reconnaissance tokens on enemy figures and use your calculated shots to drop these priority targets as fast as possible. Finally, you may play as Verena Talos, a skilled brawler who’s known for using her enemies’ own weapons against them. Whether you’re playing the campaign or a skirmish, these new heroes can have a powerful effect on the composition of your Rebel strike teams. We also explored the new forces that become available to the Imperial and Mercenary forces in Return to Hoth. The Imperials gain Snowtroopers and the SC2-M Repulsor Tank, enabling them to spread their fire or concentrate on a single enemy figure. Meanwhile, the galaxy’s Mercenaries can use the HK Assassin Droids to hunt down the Rebels or unleash a Wampa to ravage an enemy strike team. In the campaign game, the Imperials also have access to two new Agenda sets and two new Imperial classes. Whether you play with the Precision Training Class and execute carefully timed strikes against the Rebels or use the Armored Onslaught Class to increase the power of your Vehicles, the Empire gains access to new strategic avenues with this expansion. 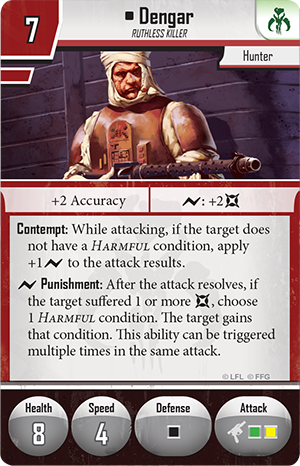 Our later previews looked at each of the corresponding Ally Packs and Villain Packs in turn to explore how they can influence your Imperial Assault campaigns and skirmishes. With the Leia Organa Ally Pack, you can bring this persuasive Rebel diplomat onto the front lines where she can exercise her natural acumen for battlefield leadership to inspire your own troops and demoralize the enemy. Alternatively, you can call upon the noble Echo Base Troopers to hold the line and defend your position at any cost. These resilient fighters are fewer in number than standard Rebel Troopers, but significantly more effective due to increased training and enhanced gear. The dark side also gains plenty of its own tools among these figure packs. General Sorin is the commander of an Imperial armor division in the sector, and he is a dangerous force on the battlefield, both due to his tactical expertise and the massive Vehicles and Heavy Weapons he’s accustomed to commanding. You may even dispatch the ruthless bounty hunter Dengar to track down the Rebel leadership from wherever they’ve gone into hiding. Dengar excels at inflicting harmful conditions on his opponents and by spreading his attacks across the board, you may soon leave your opponent’s figures crippled on multiple fronts. As the Rebels flee from the disastrous defeat at Hoth, the Empire casts its nets wide to capture as many escapees as possible. In Return to Hoth, you have the chance to become a hero and safeguard countless refugees or to finally crush the Rebellion as the Galactic Empire. Take up your blaster and join the fight! 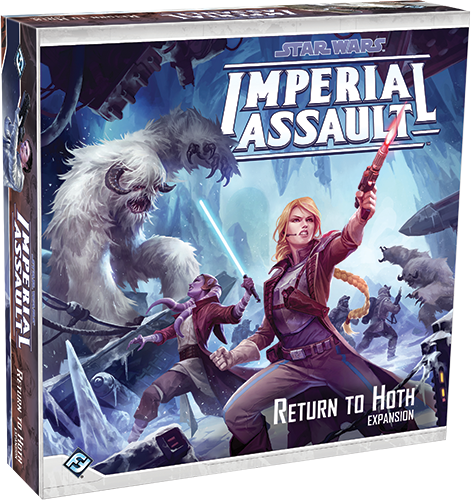 Return to Hoth and its associated Ally Packs and Villain Packs are now available at your local U.S. retailer.